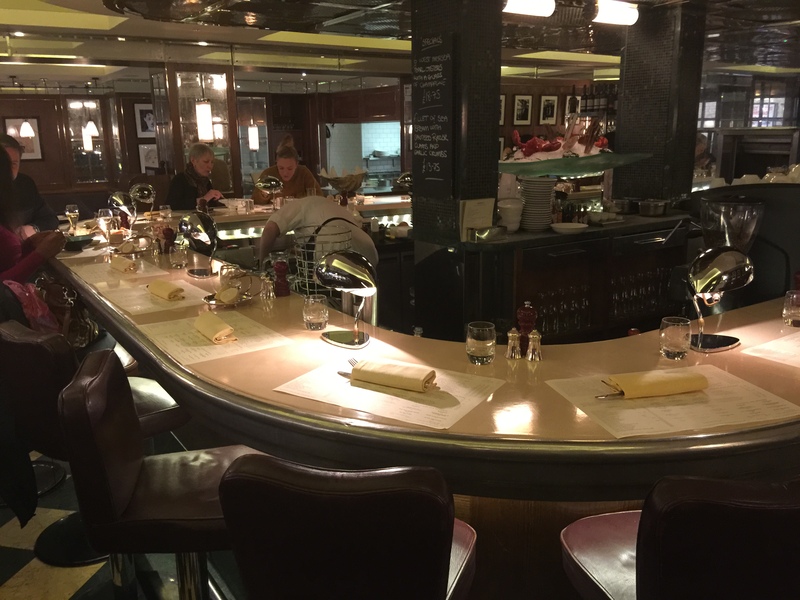 London is home to a wonderful selection of old and new oyster bars, many of which are often steeped in tradition and a kind of veiled history that lends the oysters on offer an even greater import and iconic quality. Here I decided to try three places I haven’t visited before, as my favourite oyster bars have previously been limited to such classics as Bentley’s, Bibendum and Wright Brothers in Borough Market. Now I ventured forth into new territory starting off in Covent Garden, not far from the location of the Whistling Oyster mentioned in an earlier blog, at J Sheekey (28-35 St. Martin’s Court, London WC2N 4AL), with its famed horseshoe oyster bar and walls of lacquered wood panels, decorated with signed photos of famous guests. Its oysters were Jersey and Carlingford Lough rocks (C gigas) and West Mersea natives (O edulis). They were served with wholemeal bread and some wafer thin cracker but unfortunately the rock oysters were mixed on the platter. I sensed something was wrong as I thought what I presumed were the Irish oysters tasted so differently and similar to the Jersey rocks so that when I pointed this out, the mistake (which I think is quite astonishing for such an establishment) was discovered. So how did they rate? Now we come to the very heart of a thorny subject…some oyster aficionados love to tell the world that such and such oysters taste like this or that whilst also subscribing to the very well-known fact that oysters always take on the taste of their environment (the so-called terroir or meroir factor). Well, of course, oysters from the same place can and do taste quite different from each other sometimes, and change from season to season, year to year, so all we can say is that these particular oysters to me tasted like this. Thus we could say that taste is on the tongue of the slurper! Tasting oysters finally proves that metaphysical realism is dead! So now to the oysters: the Irish Carlingford rock oysters from the border with Northern Ireland had nicely fluted shells, well-filled with juice and a plump, firm, pale meat content, which provided a good crunchy chew. Tones of veggie greens could be discerned but what surprised me most was the sudden rush of sweetness in the finish, probably a sign of the oyster’s capacity to build up glycogen reserves. Next on the list were the Jersey rocks, from the largest oyster growing area in Britain, which is located on the eastern side of the island in the Royal Bay of Grouville. Started from seed from a hatchery on the neighbouring island of Guernsey, they offered a more delicate and softer meat as well as a refreshing, crispy sea-salt taste with definite briny and algal tones. The last oyster served was from West Mersea off the Essex coast, just south from Colchester, a welcoming no 2. Most likely dredged from the nearby Blackwater river, these were jam-packed with umami, a nuttiness and mineral flavours, a sharper taste altogether compared with the rocks. The chew was again crunchy, long and ended on an almost mushroomy note. The mineral water I had ordered came in handy at this point! rocks were tremendous! Such deep long shells brimming with a firm, rich crunchy meat that oozed a sea-salty tang, brine and crispiness! A real delight indeed! Farmed in the straits on the island of Anglesey, opposite the historic Welsh town of Caernarfon, with its imposing castle and the mountain range of Snowdonia in the background, these oysters come from the same hatchery, located in the old gravel pits on Walney Island, as the other rocks on the menu, the Cumbrian rocks, which are born and bred on Morecambe Bay below the hills of the Lake District, and no doubt a triploid strain. The latter had an altogether thinner shell, more irregular in shape, with a looser and softer meat, almost translucent, which melted in the mouth. They were creamy but with a spicy, peppery kick in the after-taste which was a pleasant surprise. Next up were the Loch Ryan natives with their heavy, thick, dark shells but everyone so different. Their meat, nestling neatly almost like ears of oysters provided a shock in a way, as the beige flesh was so compact, chewy and crunchy and oozed all sorts of rich flavours: first there was an oily burst, followed by a creamier taste, then overridden by umami or briny sensations but with edges of definite nutty and veggie tones, like spinach and mushrooms, and lastly a sudden tang of sweet peppers. These complex oysters are dredged and carefully selected by hand, their cultivation being a showcase for sustainable fishing. After such a feast, the wandering whiffs from the kitchen became too much and I could not resist the temptation of taking a lobster po’ boy which also was woofed down without too much of an effort. 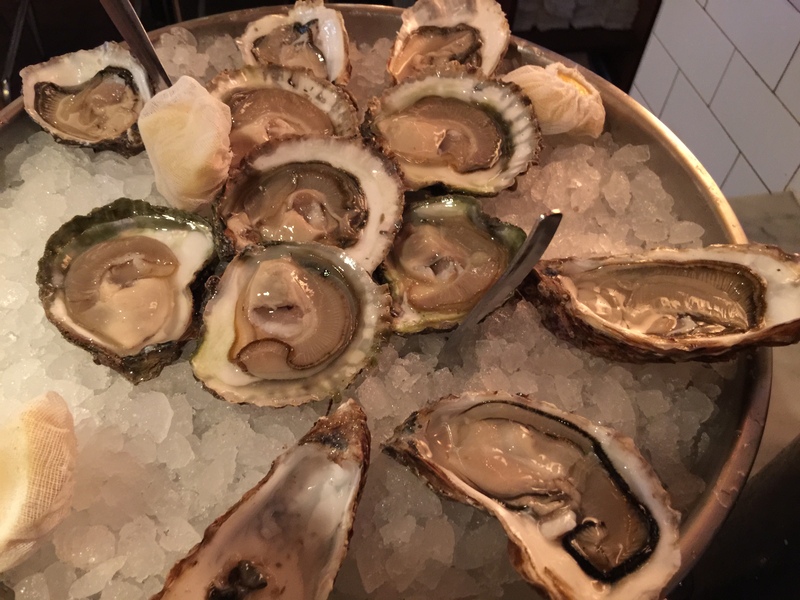 I had thought of stopping there since it was difficult to think of having any better oysters than these but the luring ambiance of Bentley’s, just round the corner from Piccadilly, hovered around in my mind. Suddenly, I was walking past Hix Soho (66-70 Brewer Street, London W1F 9UP), and I peered at their menu, and discovered their offerings of Lindisfarne rocks and Duchy of Cornwall natives, which seemed too good an opportunity to miss. Hix have a deserved reputation for good, traceable food, demanding healthy practices in all of its suppliers. I talked to the barman about the contradiction of serving triploids from Lindisfarne and the natives from the Duchy of Cornwall which also are wild and dredged, but by sailing boats in the lovely Fal estuary. The oysters were served with their top shells in place, strangely enough, which lifted off smoothly enough. That meant the ritual of eating assumed another form that felt in the first instance a bit awkward. 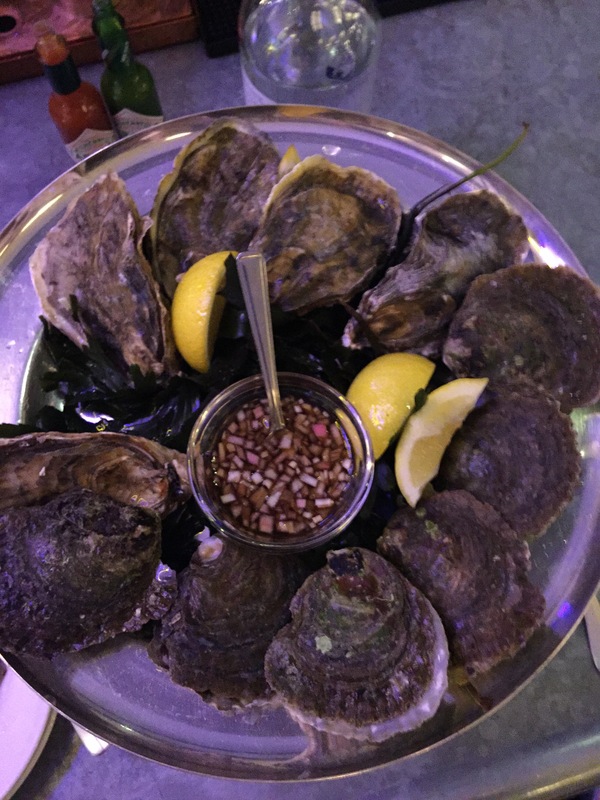 Eating oysters always implies a certain ritual so there is little scope for sudden variations or new innovations and the presentation of oyster flesh on the half shell always seems a pleasing sight. Another oddity was the white, spongy, bread roll served with the oysters. First the Lindisfarne rocks had thin beige shells, which I always regard as a sign of accelerated growth. The meat was plump, soft but quite chewy with round flavours of the sea and a slight algal taste. Secondly, the small natives, no 3s, were a pungent lot on the nose, and I had to refuse two of them, whilst a third gave me certain reservations, but I decided to slurp it anyway, without any later dire consequences, I might add! This is a problem sometimes with smaller native oysters, as often there is very little juice in them because of their flat shape, and the flesh is much harder and chewy. The dark brown meat, thinner and tougher, had a real blast of a metallic, brassy flavour but could also have a creamy, soft texture when umami tones dominated. Sometimes it is difficult to distinguish between the intense metallic aroma of a native and one that is over the hill and may have lost its juice. But if in doubt, always ask for another! I felt that these natives from the Duchy were inferior to the rich, complex flavours of the Loch Ryan flats, but comparing oysters is sometimes like comparing apples with cherries. However, I was thrown off from my attempts to focus on their flavours by the two natives that I had to send back, but we always need to be on our guard against oysters that have had to endure an arduous journey on their way to our plate and palate! By the time the last of the 36 oysters had been polished off, I felt well and truly satisfied with having tasted eight distinctive British oysters all in one day. My visit to Bentley’s had to be abandoned until another time. The wait will be worth it!